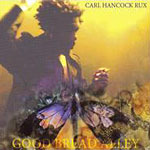 Poet and spoken word artist Carl Hancock Rux makes his Thirsty Ear debut with Good Bread Alley. Long considered to be a genre-bending musician who skirts the boundaries between a variety of stylesnew soul, underground hip-hop, rhythm and blues, electronica, psychedelia, funk, free jazz, and everything in betweenRux is a natural candidate for Thirsty Ear's genre-eradicating Blue Series. This third album features a stripped-down palette with notable special guests, including slide guitarist Dave Tronzo and violinist Leroy Jenkins, both of whom appeared on Rux's previous album, Apothecary RX (Giant Step, 2004). From the soulful crooning of "My Brother's Hands" to the gospel-inflected anthem "All The Rock Stars," the funky blues groove of "Lies," the cabaret-styled "Thadius Star" and the anthemic R&B chorus of "Living Room," Rux traverses musical boundaries like jumping lines on a map. Accompanied by the vocals of Marcelle Lashley and the casually plucked slide guitar of Tronzo on "Geneva," Rux delivers a postmodern blues that is as emotionally raw as its ancestors from the Delta. Leroy Jenkins contributes a ghostly solo to the experimental spiritual "Black of My Shadow," while Vinicius Cantuaria plays acoustic guitar in support. Rux's lyrics are at once uplifting and forewarning; his cautionary tales that speak to the optimist in each of us, no matter what our individual plight may be. Combining political activism with personal lyrics, Rux states his case with his smooth baritone. His band plays with a decidedly organic touch and very little electronic augmentationa refreshing respite in these days of computerized beats and Pro Tools tomfoolery. Regularly compared to the Southern Fried Soul of Bill Withers (whose Vietnam War-era protest ballad "I Can't Write Left Handed" he covers here), as well as the political activism of Gil Scott Heron and the psychedelic blues of the Lizard King, Jim Morrison, Rux weaves these diverse influences together to create a singular sound. A musical chameleon, Good Bread Alley has enough tastes to satisfy the most discerning listener. Track Listing: Good Bread Alley; My Brother's Hands; Thadius Star; Behind The Curtain; Lies; Geneva; Black of My Shadow; All The Rock Stars (for Kurt Cobain); Living Room; I Can't Write Left Handed; Better Left Unsaid. Personnel: Carl Hancock Rux: vocals; Jaco van Schalkwyk: samples, noise programming; Kwame Brandt Pierce: piano, keyboards, harpsichord; Brian Charette: keyboard (7); Rob Hyman: keyboard (8); Jason DeMatteo: bass; Fred Cash: bass (7); Stewart Lerman: bass (8); Chris Eddleton: percussion; Sammy Merendino: drums (8); Dave Tronzo: slide guitar (6,8); Vinicius Cantuaria: acoustic guitar (7); Leroy Jenkins: violin (7); Marcelle Lashley: vocals (6); Helga Davis: vocals (7); Christalyn Wright: background vocals (2,3,10); Stephanie Battle: background vocals (2,3,10).